Cold rolling is a process which passes metal through rollers at temperatures below its recrystallization temperatures. This increases the yield strength and hardness of the metal. This is done by introducing defects into the crystal structure of the metal creating a hardened microstructure which prevents further slip. Because the metal is at room temperature, it is less malleable than metal above its recrystallization temperature. This makes cold rolling a more labor intensive and expensive process than hot rolling. 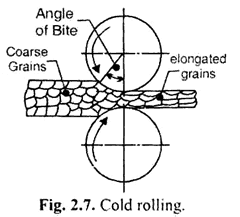 Cold rolling can also reduce the grain size of the metal resulting in Hall-Petch Hardening. The material is first hot rolled near to the finishing size and then cold rolled to the required size with highly finished rollers. The hot rolled articles are first immersed in a weak solution of sulphuric acid to remove the scale and washed in water, and then dried. This process of cleaning the hot rolled product is known as pickling. These cleaned (pickled) products are then passed through rollers at room temperature. The rolling mills are similar to that used in hot rolling. The cold rolling process has the advantage of providing close dimensional tolerance up to 0.025 mm. It also improves toughness, hardness, mechanical strength, surface finish of the material. Softer metals like tin, silver, gold, aluminum and its alloys undergo cold rolling. Due to absence of any higher working temperature the surface finish of the rolled product is good. Also, the reduction in size per pass is very less. The cold rolling process also improves the machinability of the metal. The cold rolling process has the advantage of providing close tolerance up to 0.025 mm. The cold working does not need expensive tools and hence it is cheap and easy to handle. The pressure required in cold working is very high. The reduction in size per pass is very less in cold working process. The grain structure obtained is not as fine as in case of hot rolling process. The impurities will not be uniformly distributed.